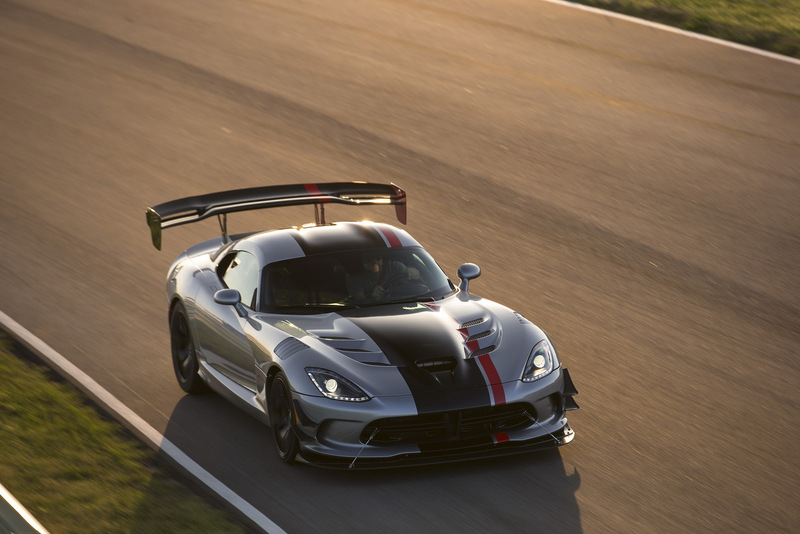 The magical American Club Racer (ACR) designation returns with the 2016 Dodge Viper ACR, the fastest street-legal track Viper ever made. 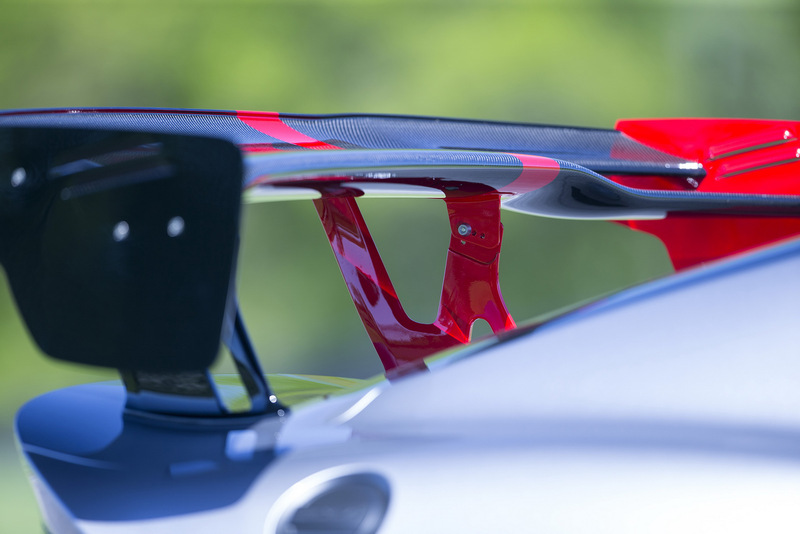 The car is offered with an available Extreme Aero package that allegedly produces the highest aerodynamic downforce of any production car. 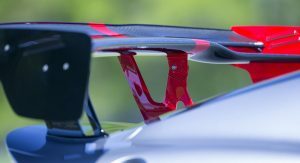 During on-track testing, development engineers have experienced nearly 1 ton (2,000 lbs) of downforce at top speed of 177 mph (285 km/h). 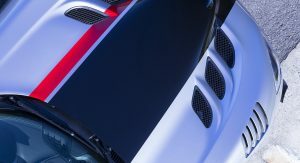 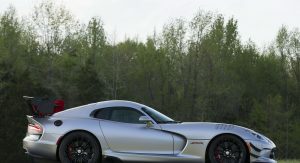 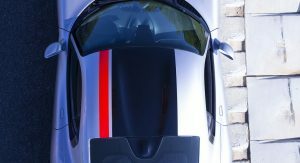 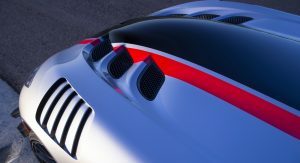 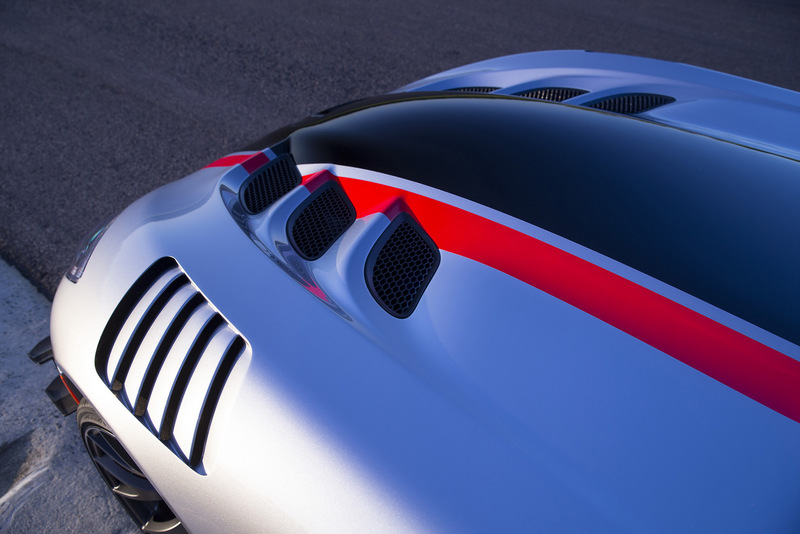 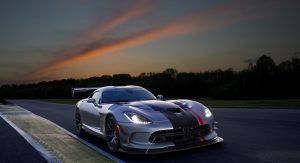 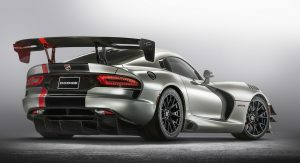 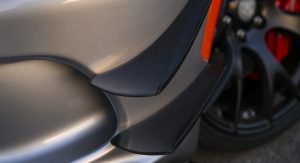 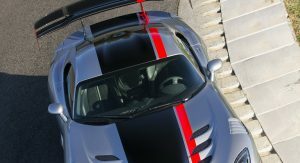 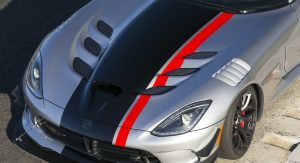 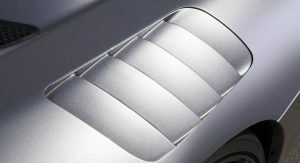 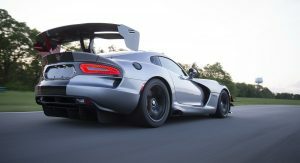 The package includes a 1,876-mm wide adjustable dual-element rear wing, rear carbon fiber diffuser, unique SRT hood with removable louvers, detachable extension for the front splitter and four dive planes. 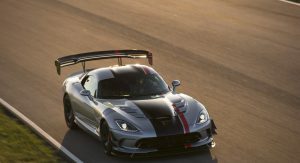 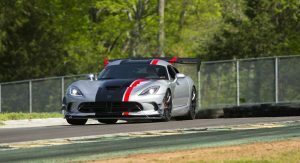 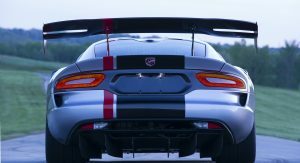 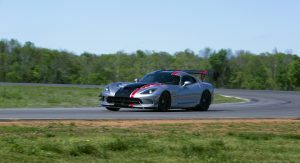 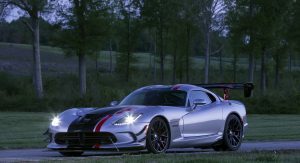 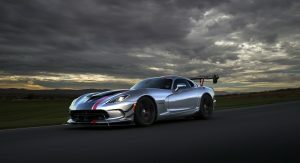 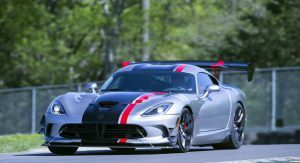 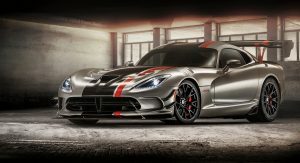 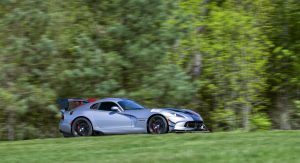 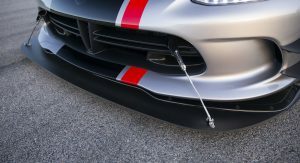 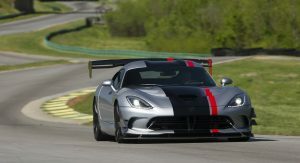 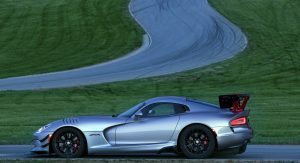 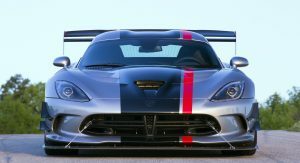 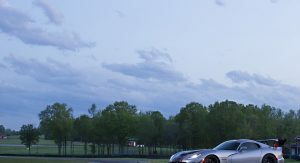 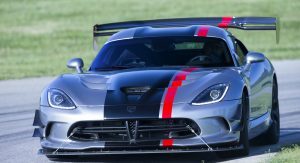 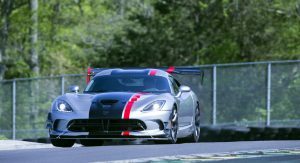 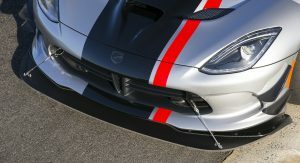 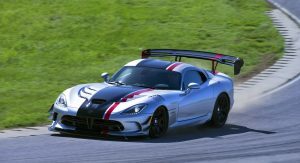 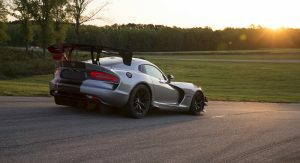 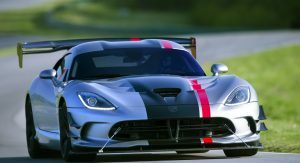 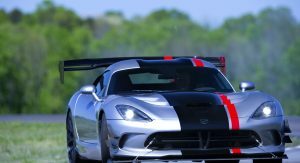 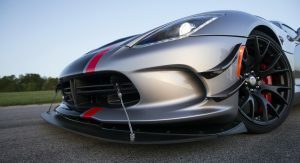 Dodge says the Extreme Aero package delivers more than three times the downforce of the Viper TA (Time Attack) 2.0 package. 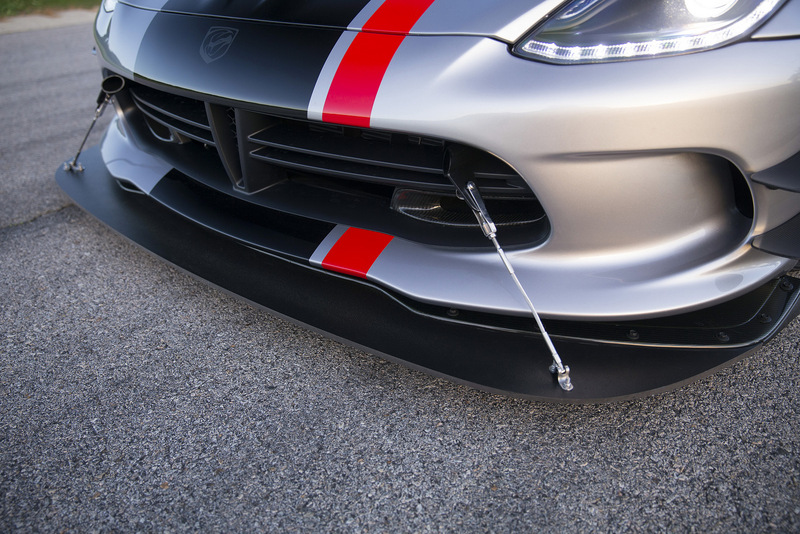 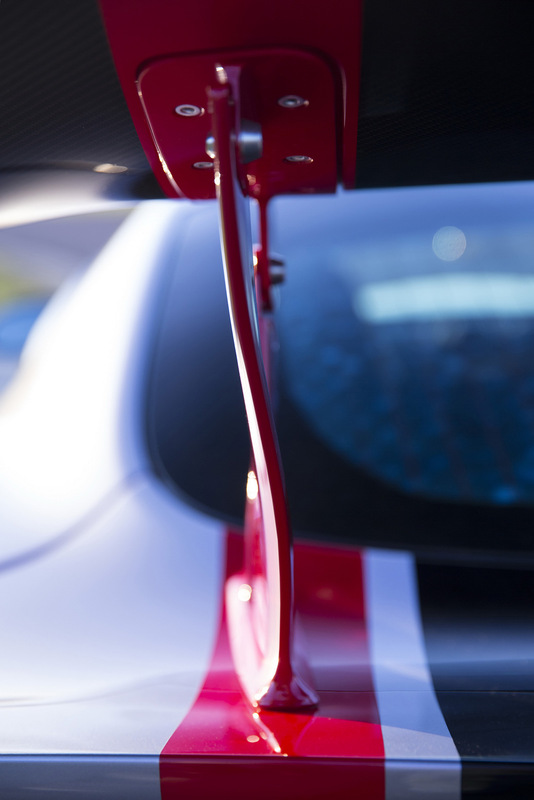 The rear carbon fiber diffuser includes six removable strake extensions, designed to rub against the track surface for increased straight-line stability and optimized downforce. 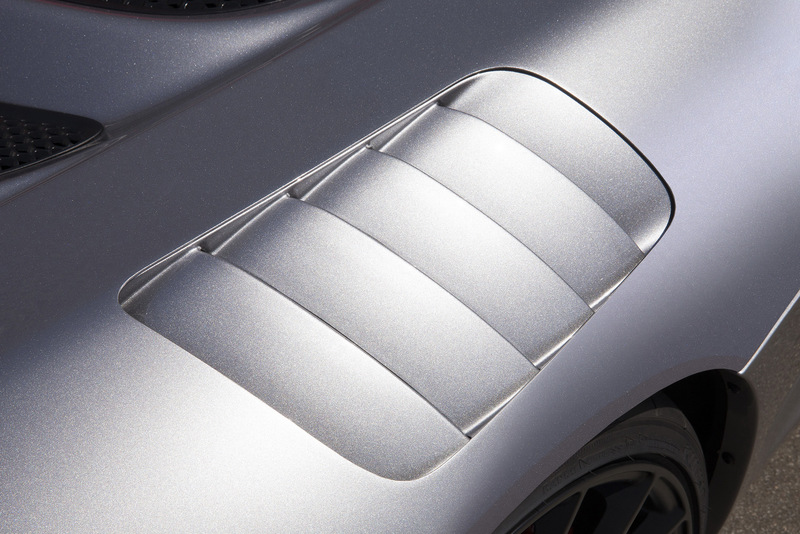 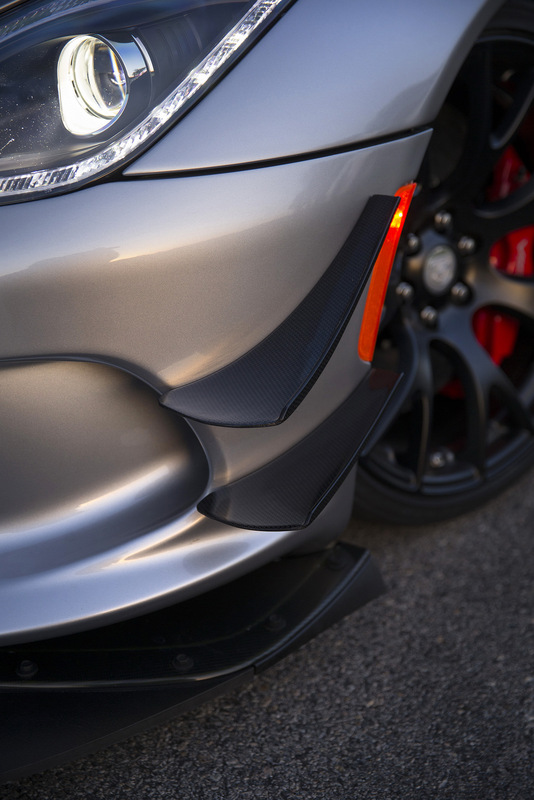 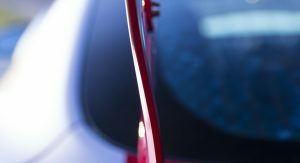 Additionally, the detachable front splitter extension and dive planes work with the rear aero treatment to provide outstanding grip and balanced performance on the track. 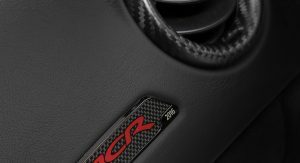 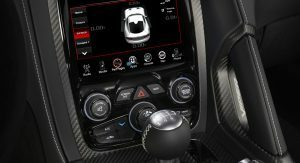 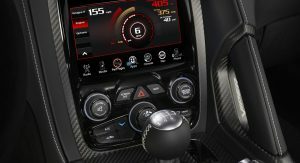 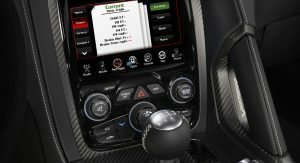 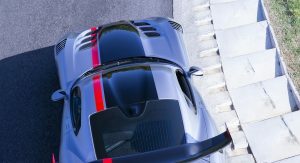 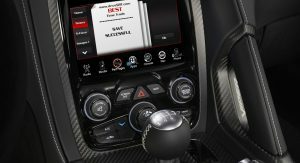 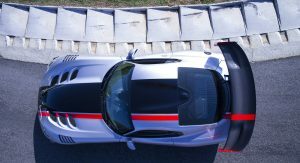 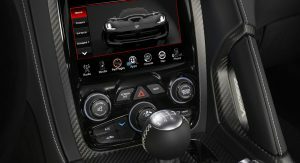 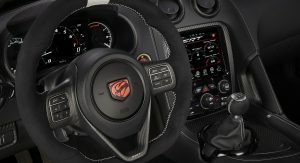 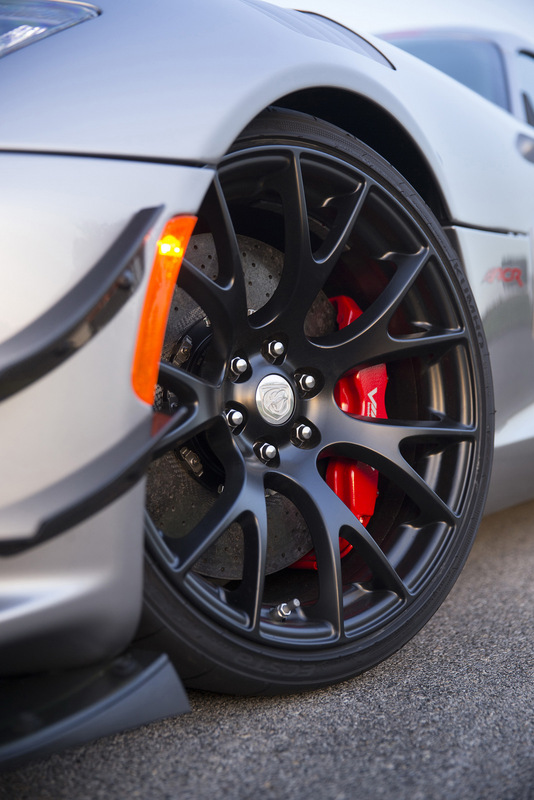 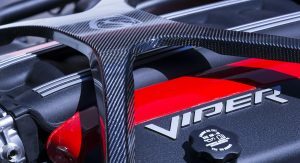 In terms of braking, the 2016 Dodge Viper ACR features new Brembo Carbon Ceramic Matrix brakes with “unprecedented brake fade resistance” and greater handling capability through reduced un-sprung weight. 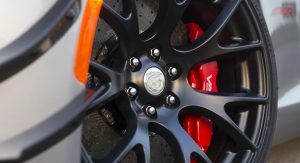 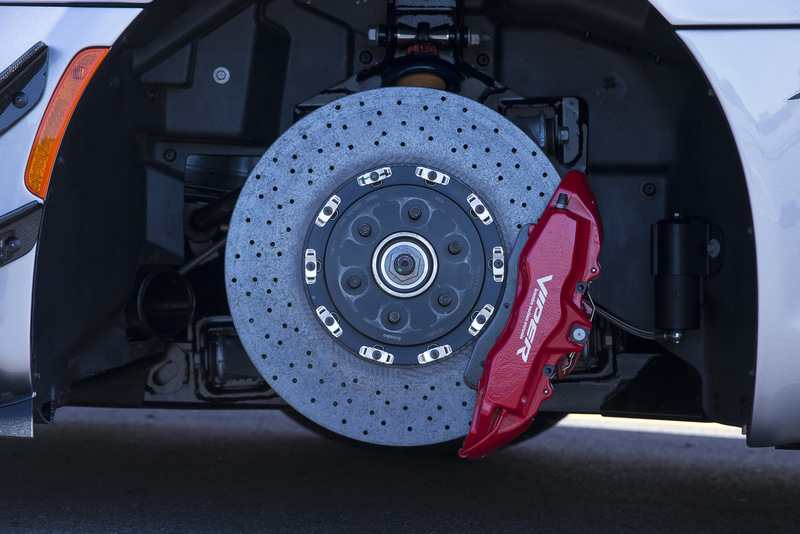 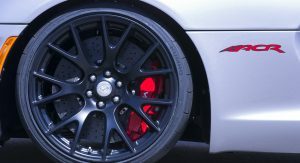 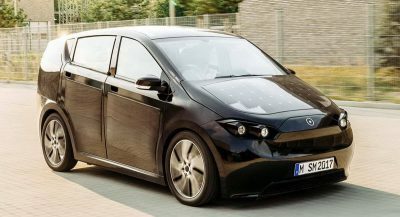 The braking system uses 390mm (15.4in) two-piece front rotors and 360mm (14.2in) two-piece rear rotors. 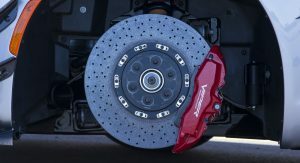 Front brakes use six-piston Brembo calipers while the rear brakes use four-piston calipers. 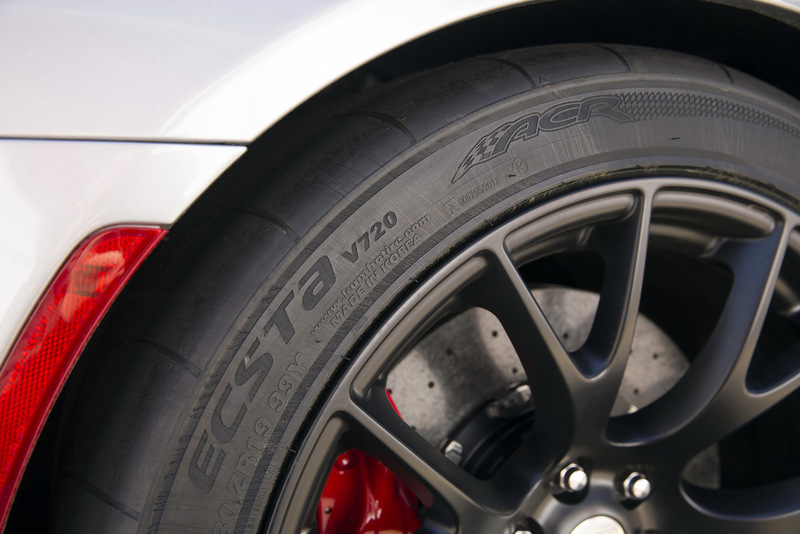 The ABS and ESC have been specifically tuned for ACR to take into account the extra grip provided by the additional aero and Kumho tires. 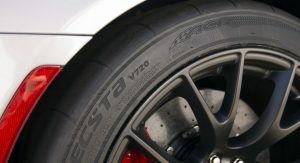 Speaking of which, the Kumho Ecsta V720 high-performance tires have been designed specifically for the car with unique tread pattern and compounds for front and rear. 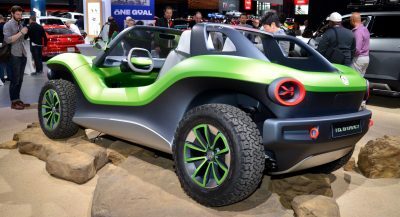 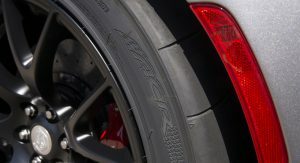 In testing, the tires alone helped shave 1.5 seconds of lap times than off-road only race tires. 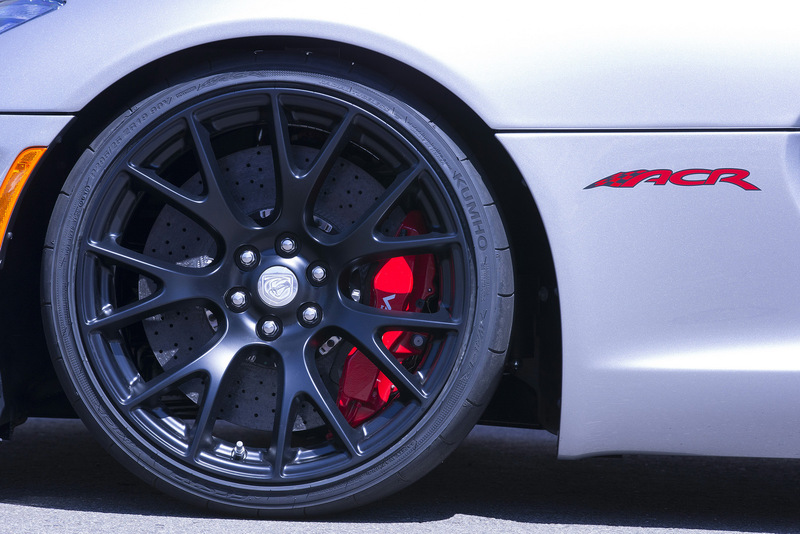 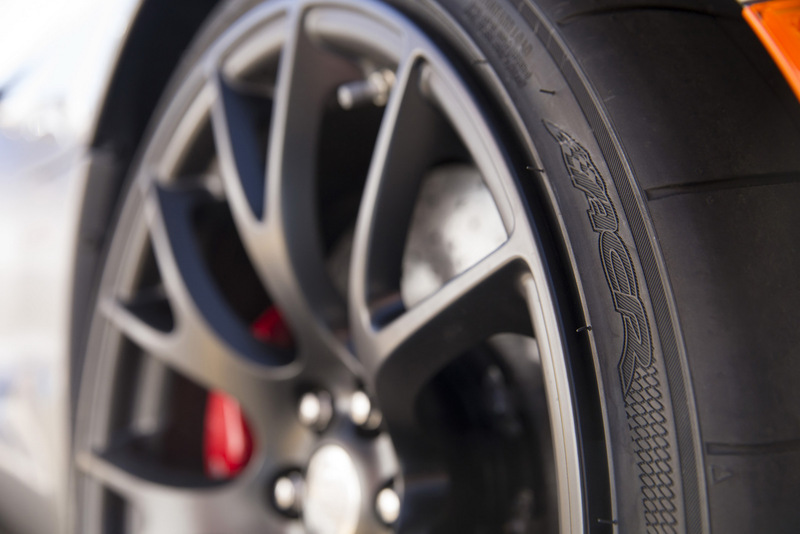 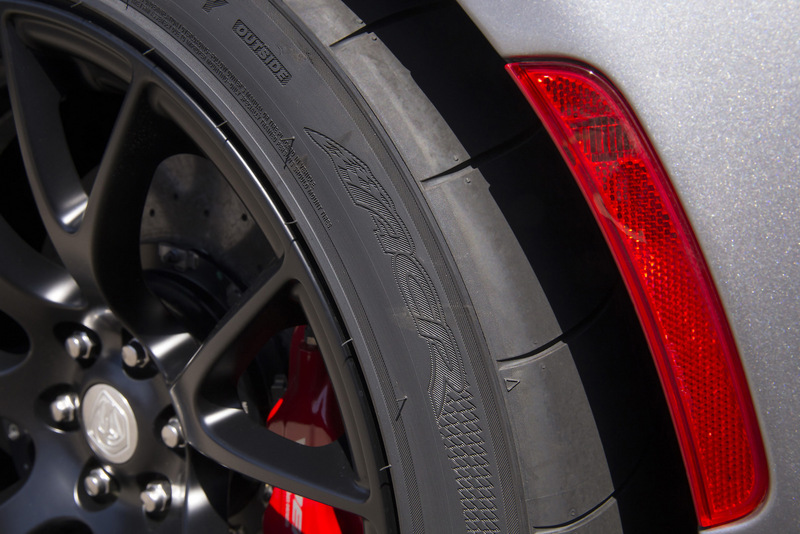 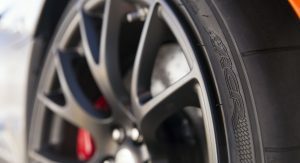 At the front, the Viper ACR features low-profile 295/25/19 tires mounted on wider 11-inch wide wheels combined with 355/30/19 rear tires. 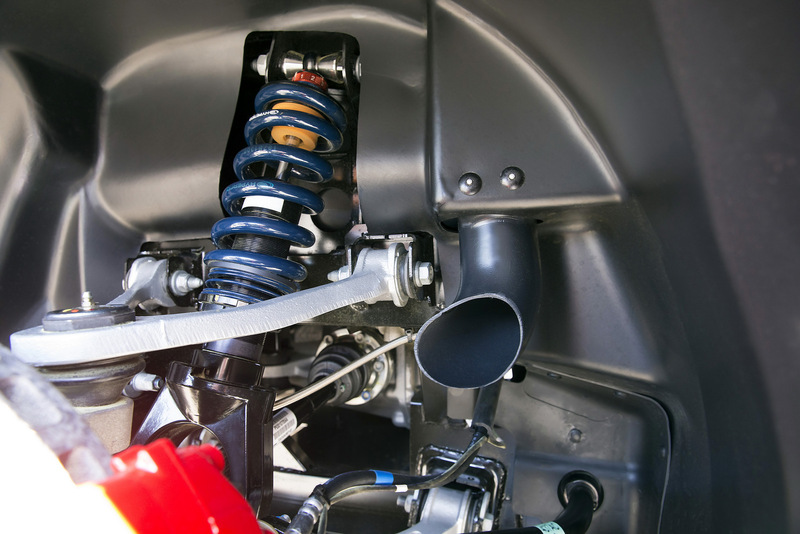 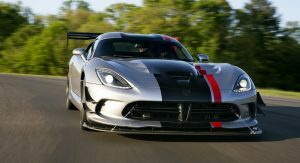 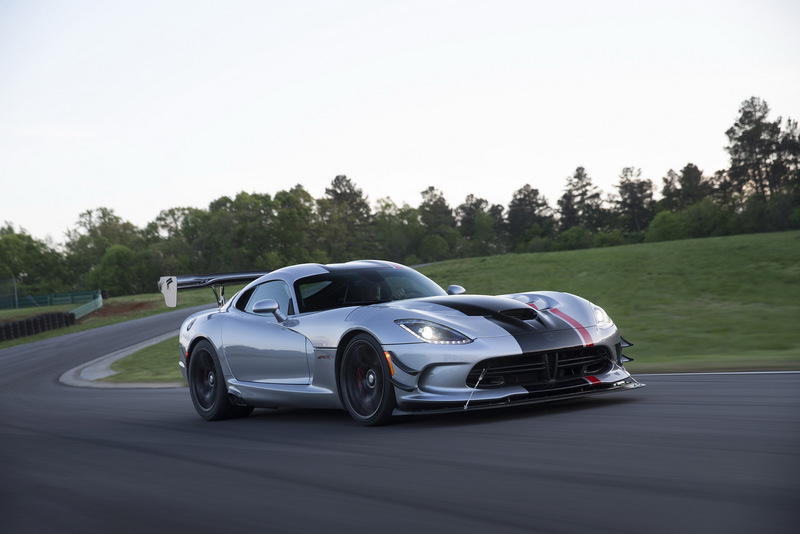 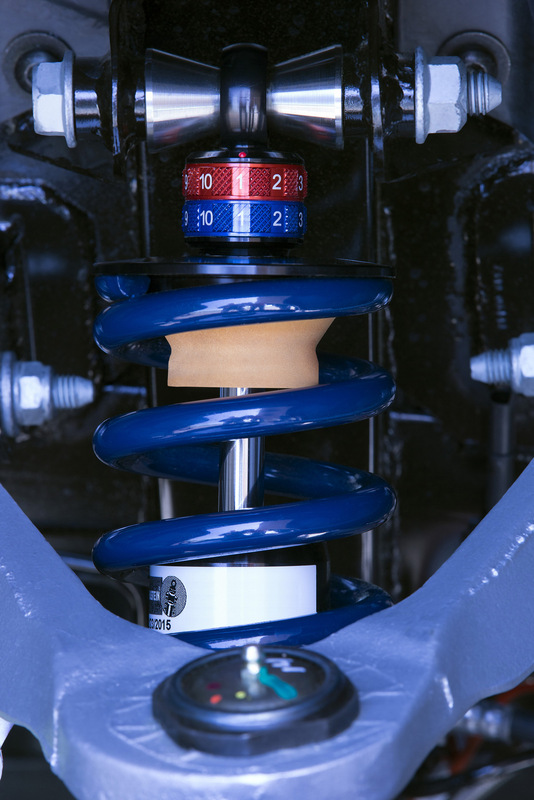 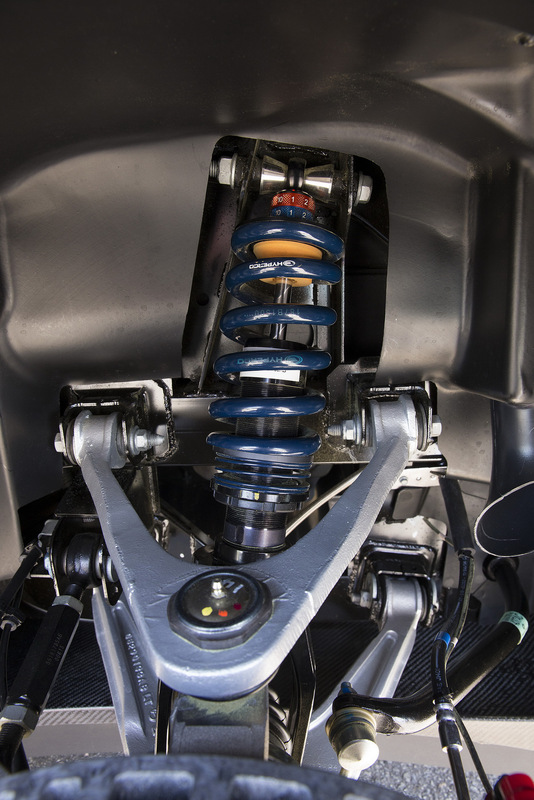 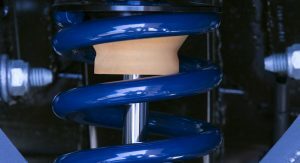 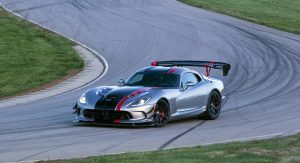 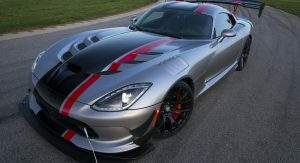 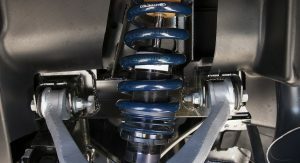 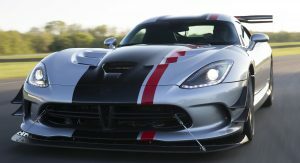 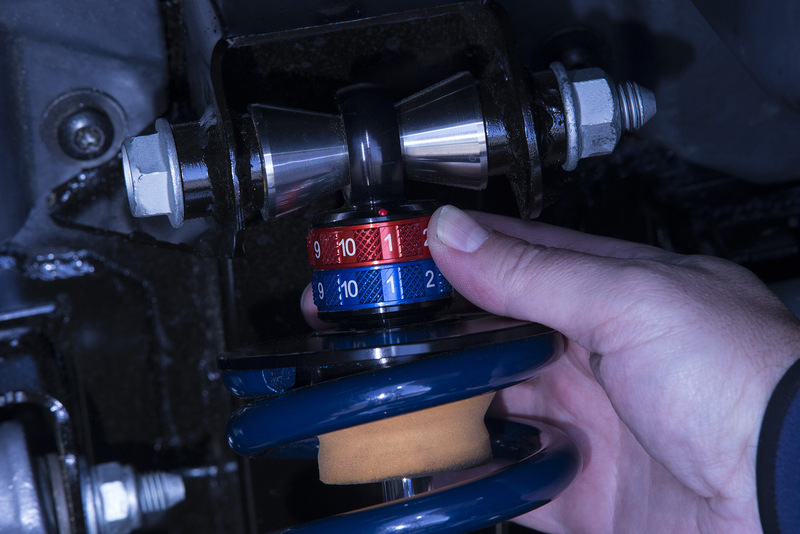 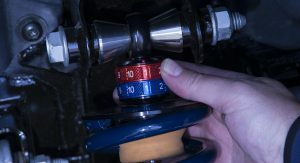 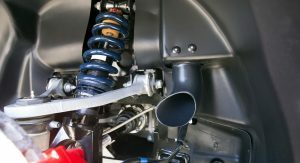 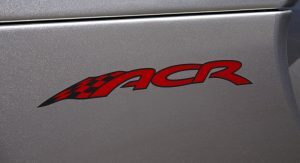 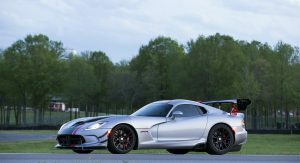 Other modifications include aluminum bodied, double-adjustable coil-over Bilstein race shocks designed specifically for the Viper ACR, with the suspension package providing more than 3 inches (76mm) of ride height adjustment. 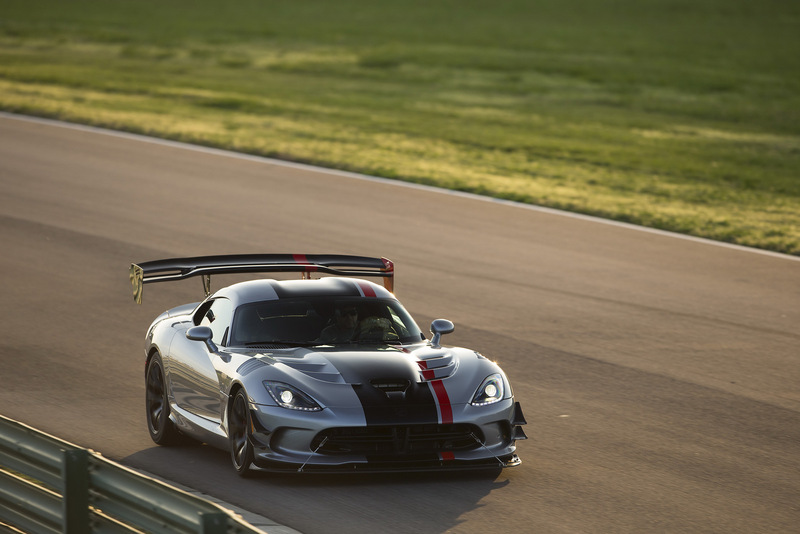 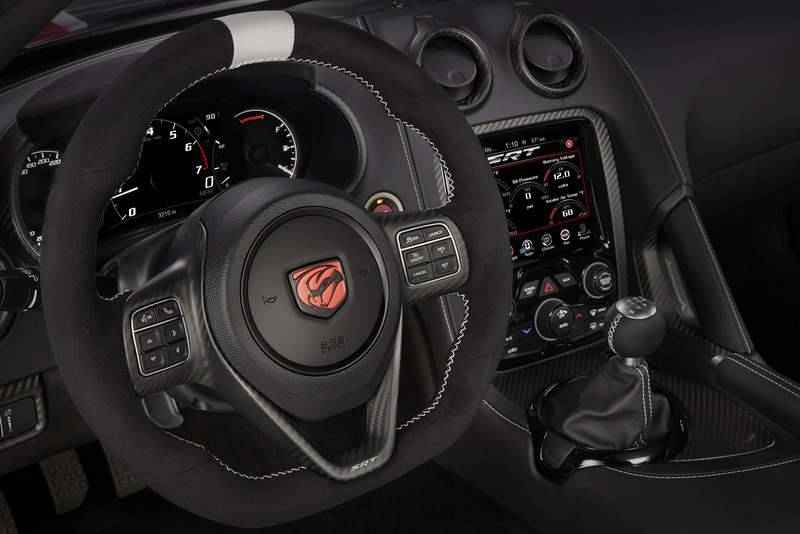 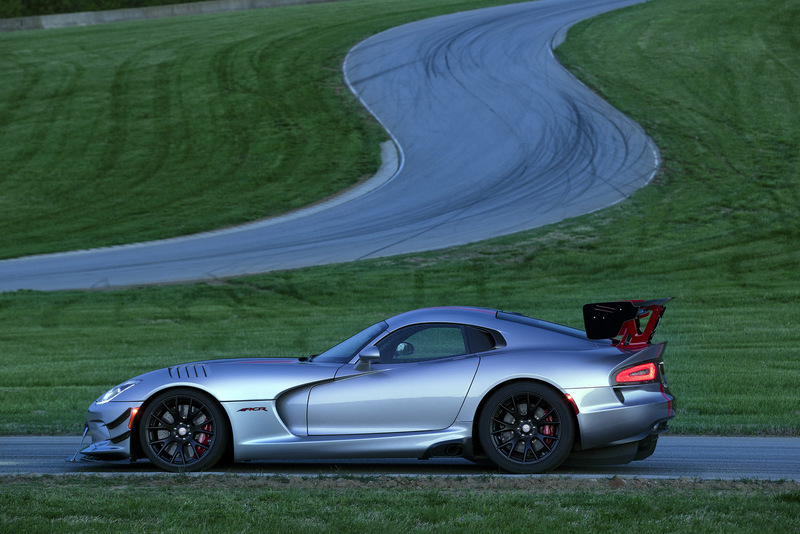 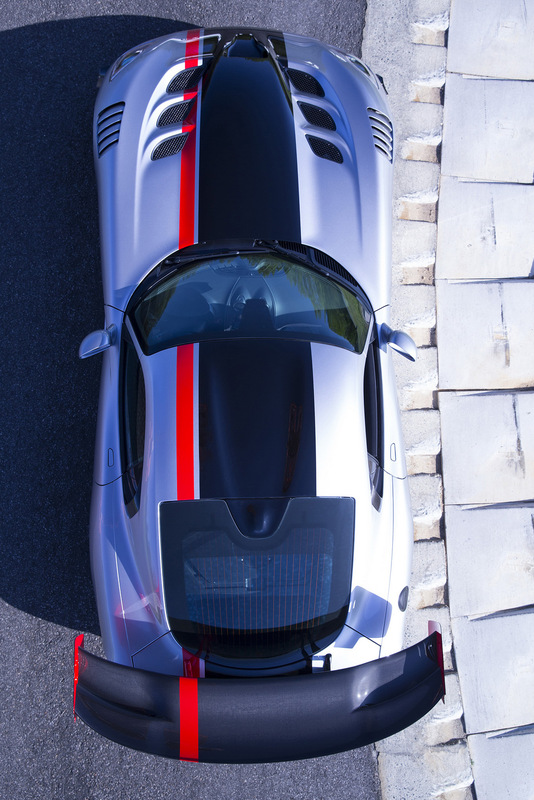 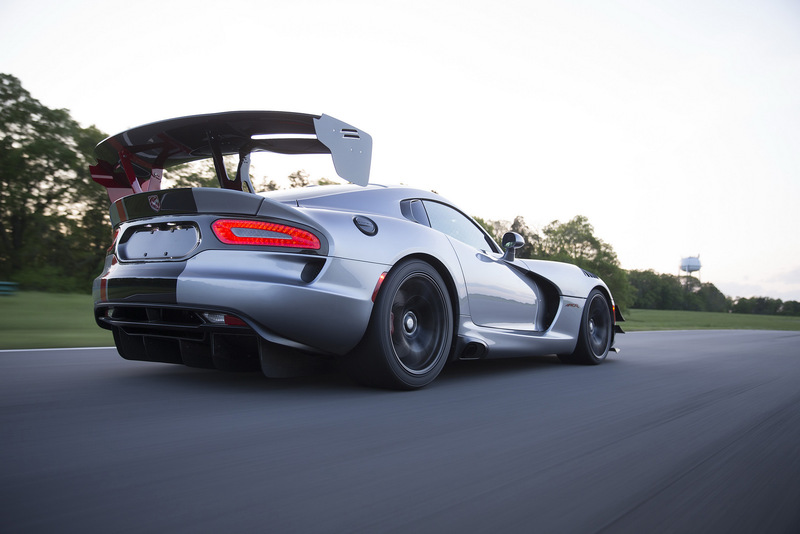 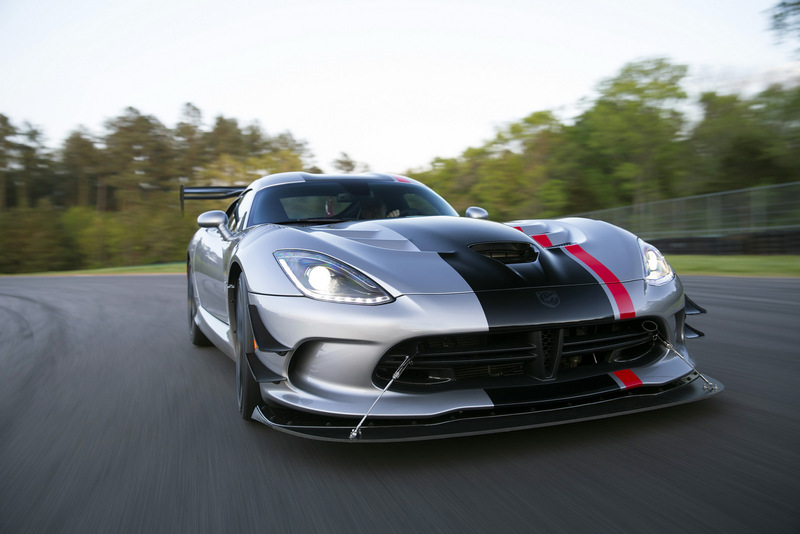 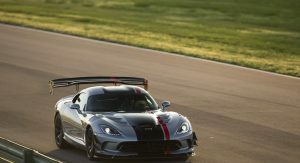 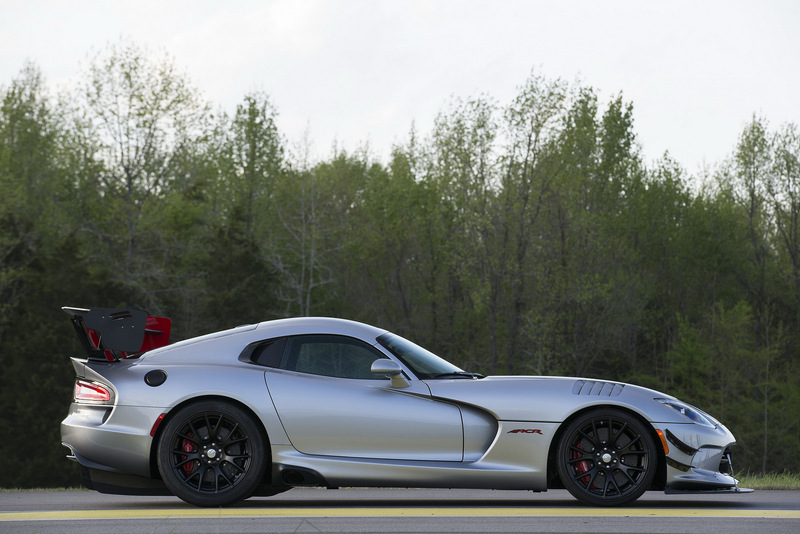 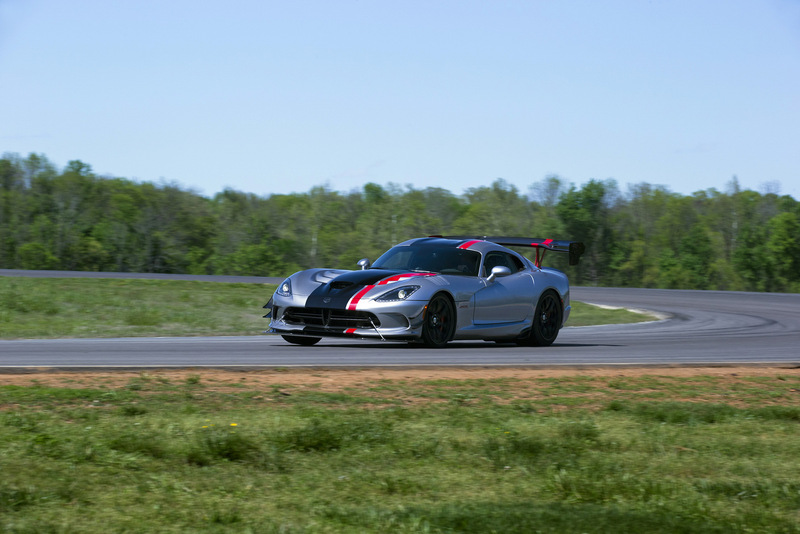 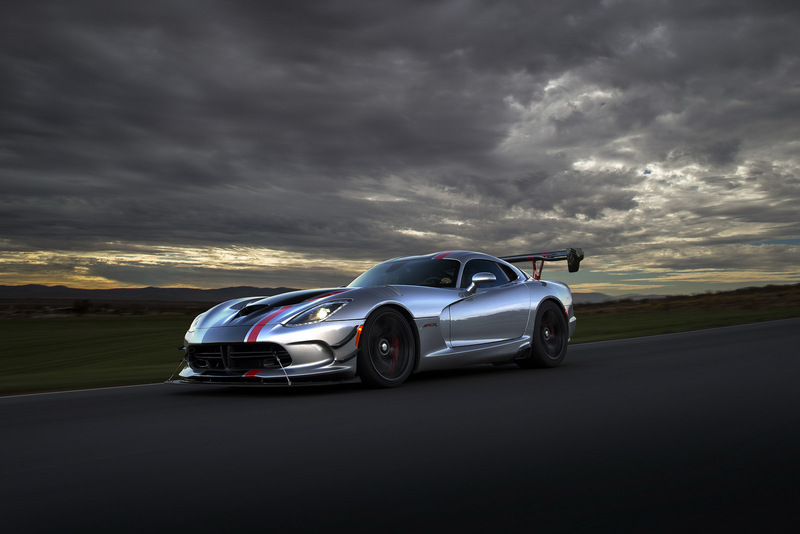 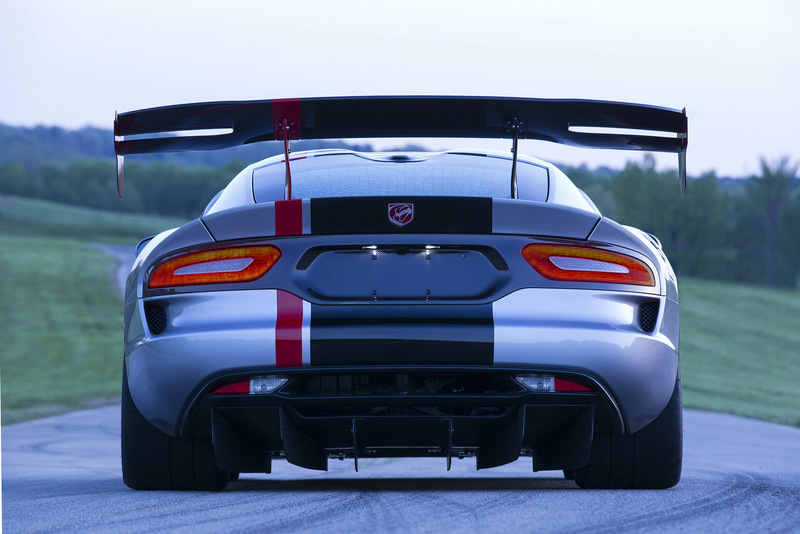 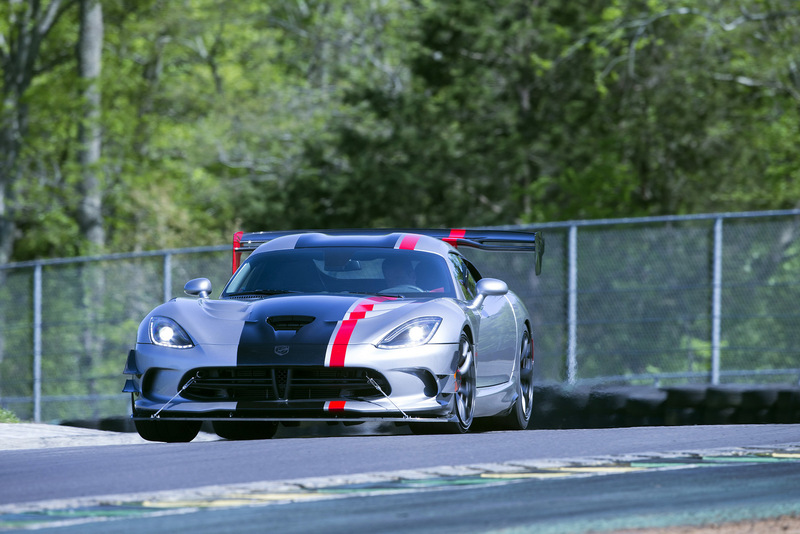 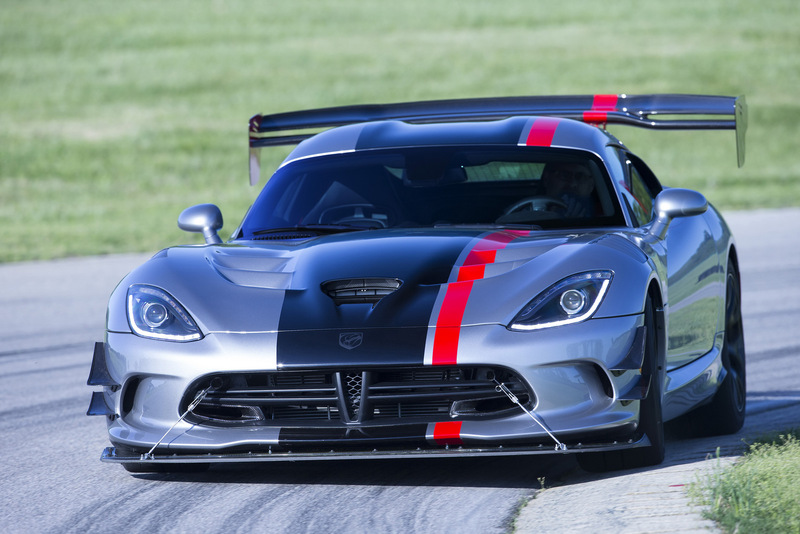 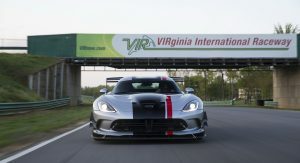 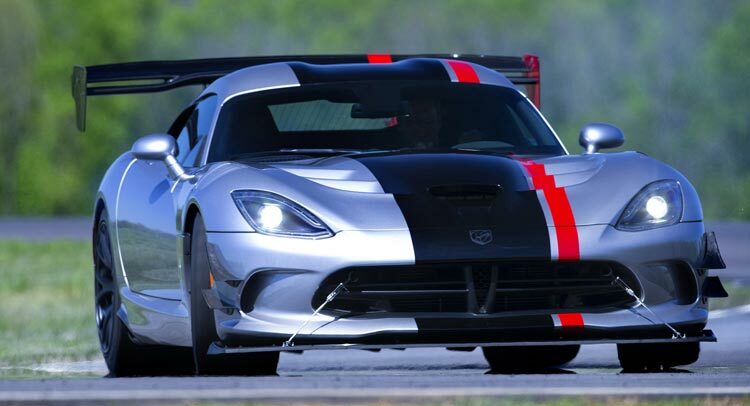 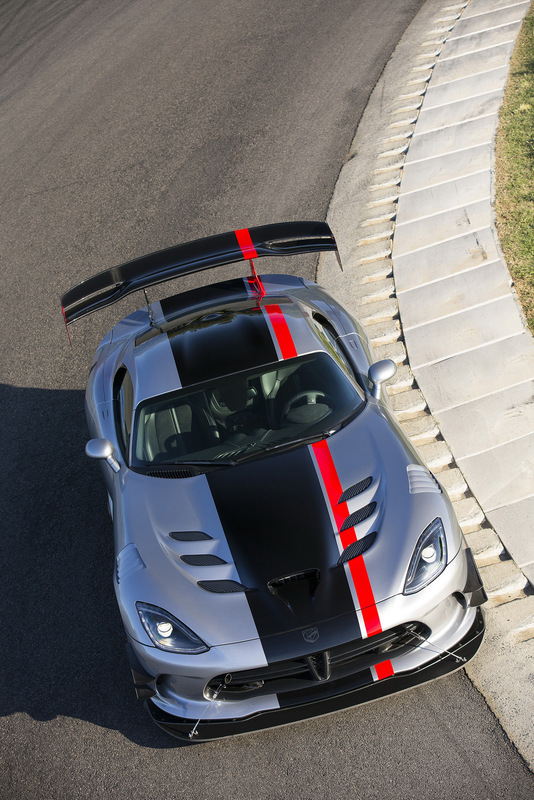 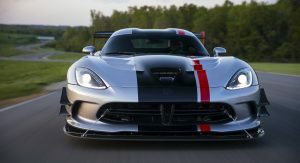 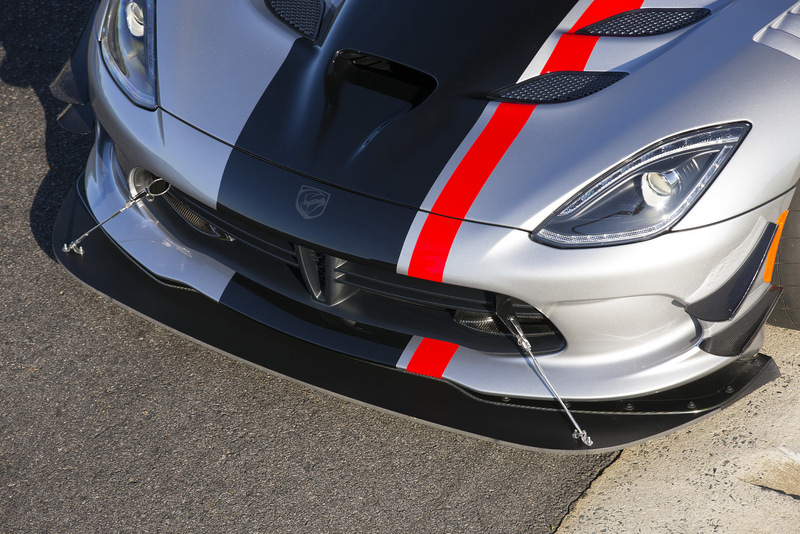 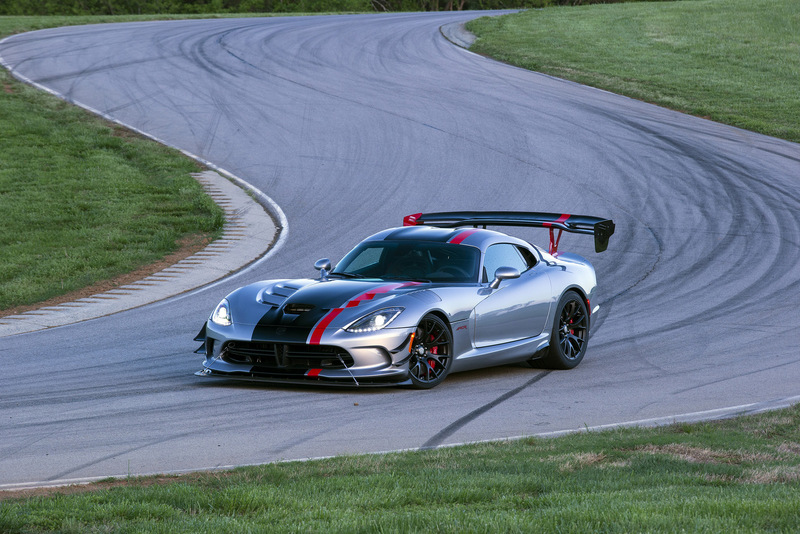 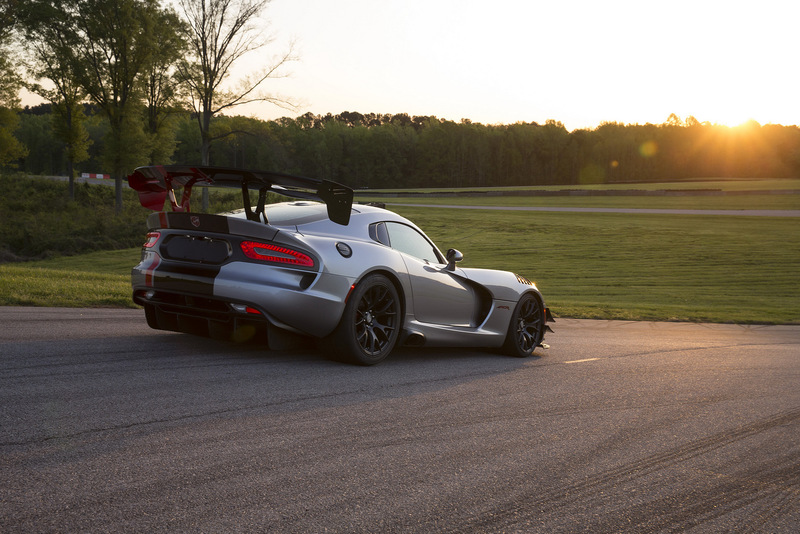 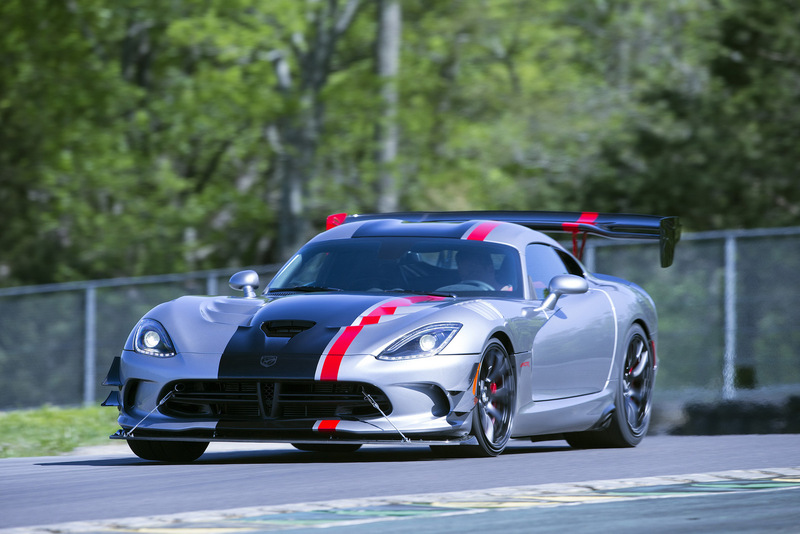 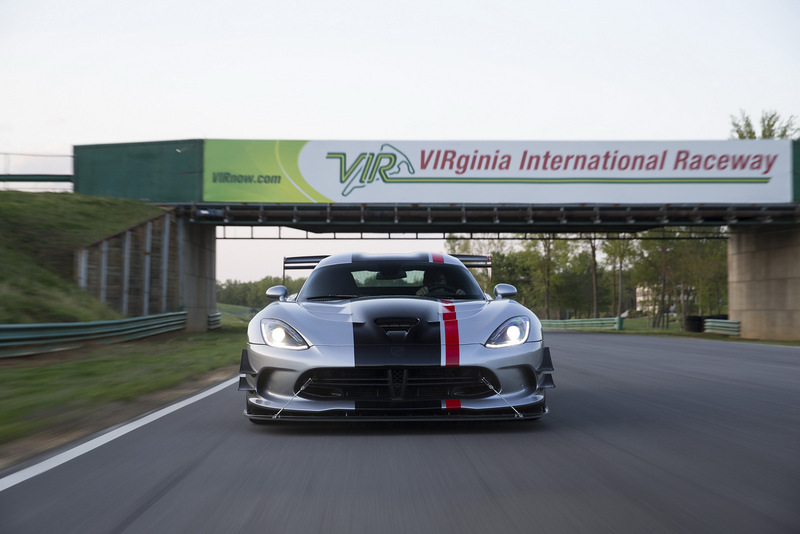 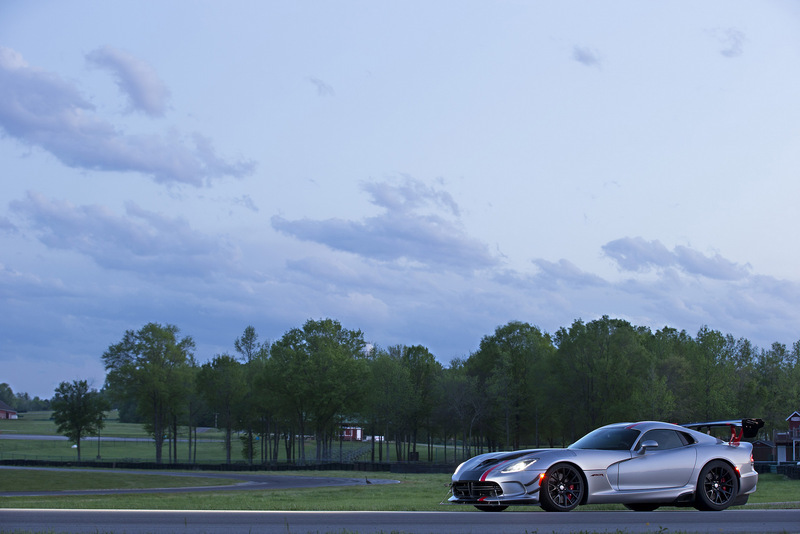 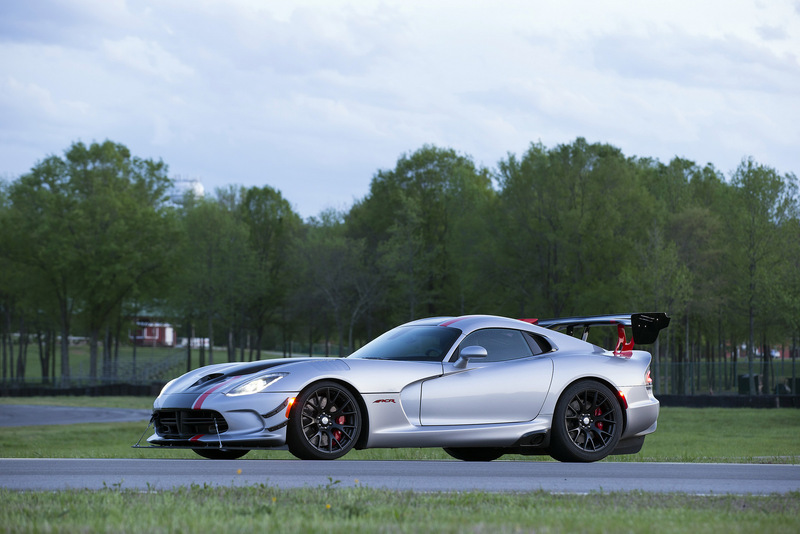 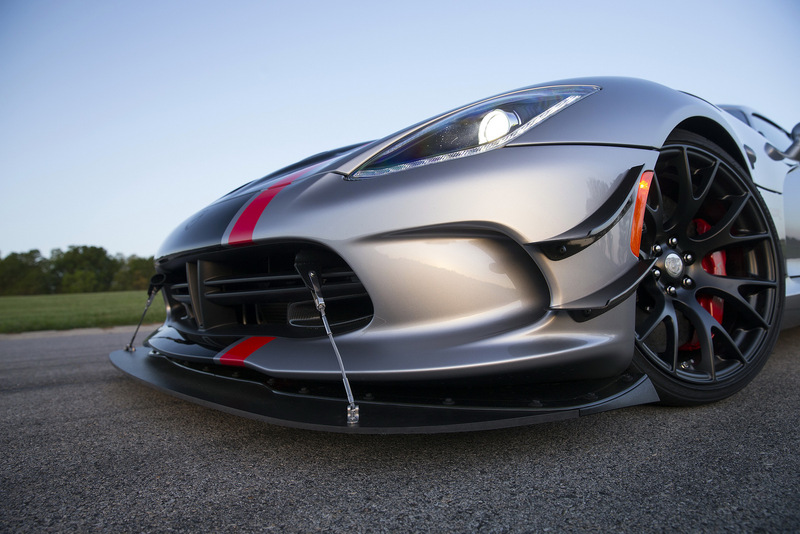 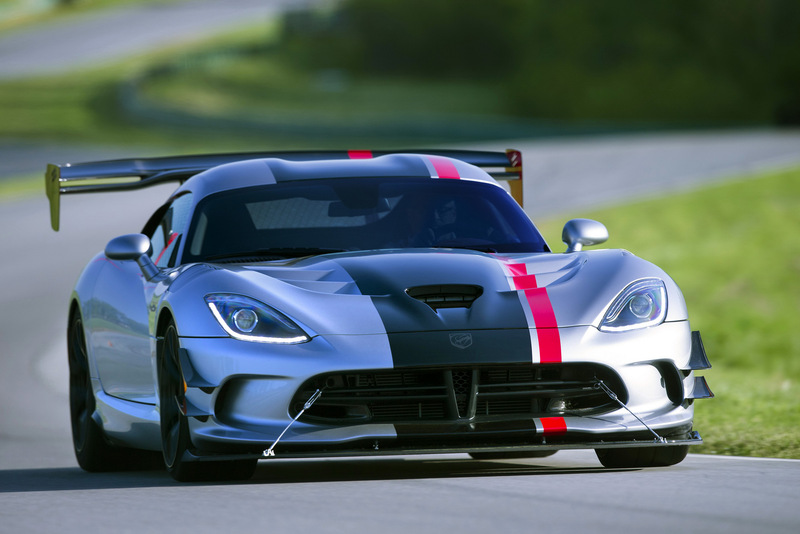 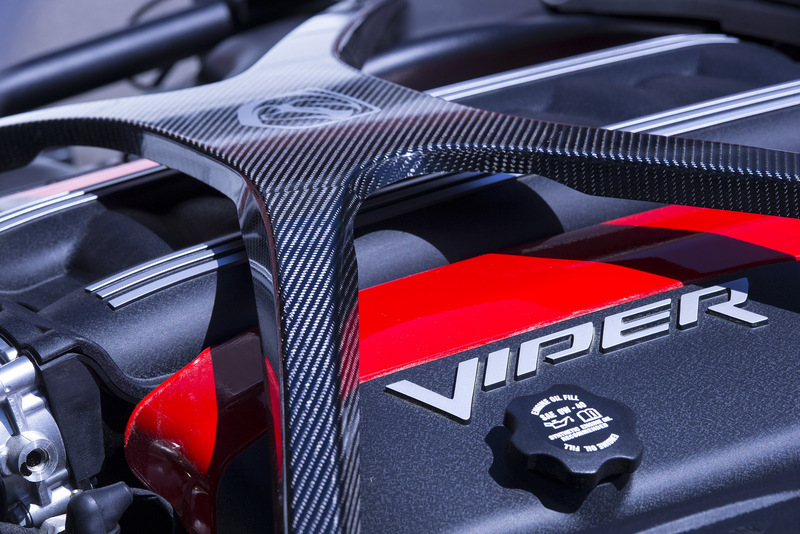 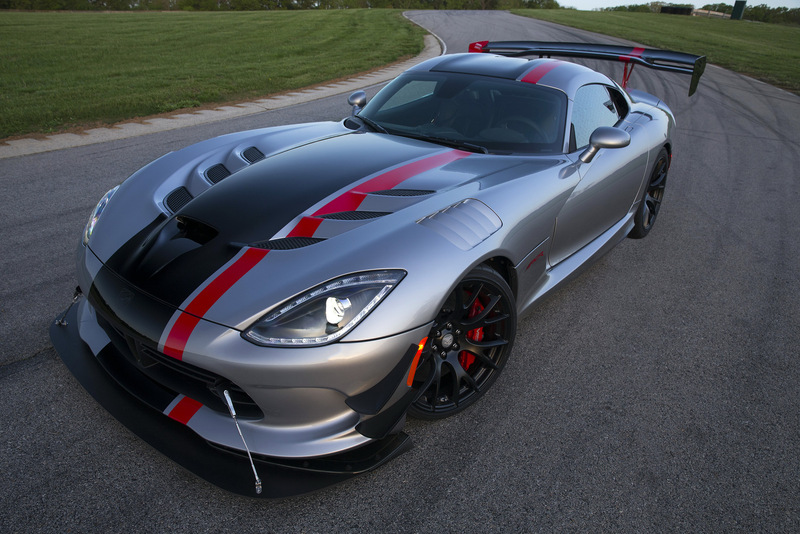 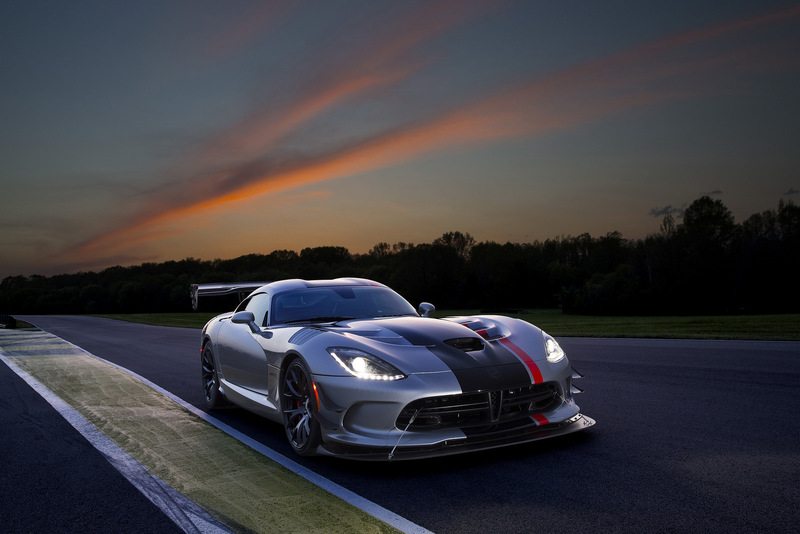 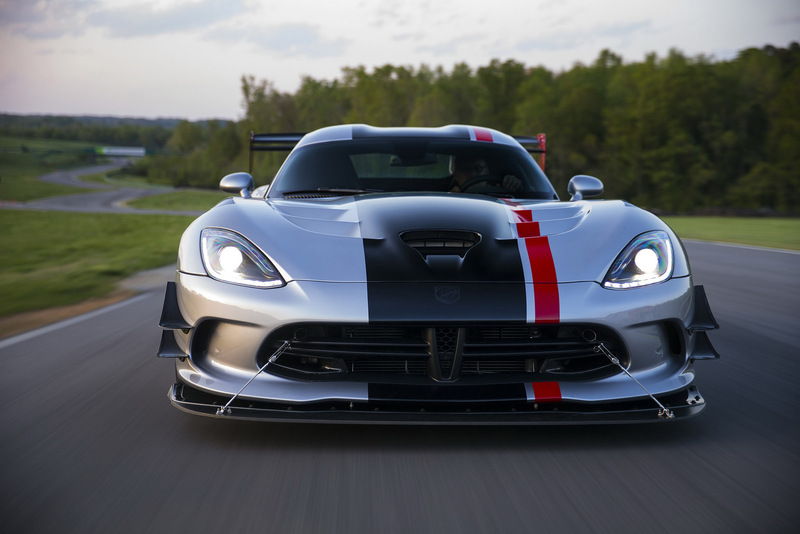 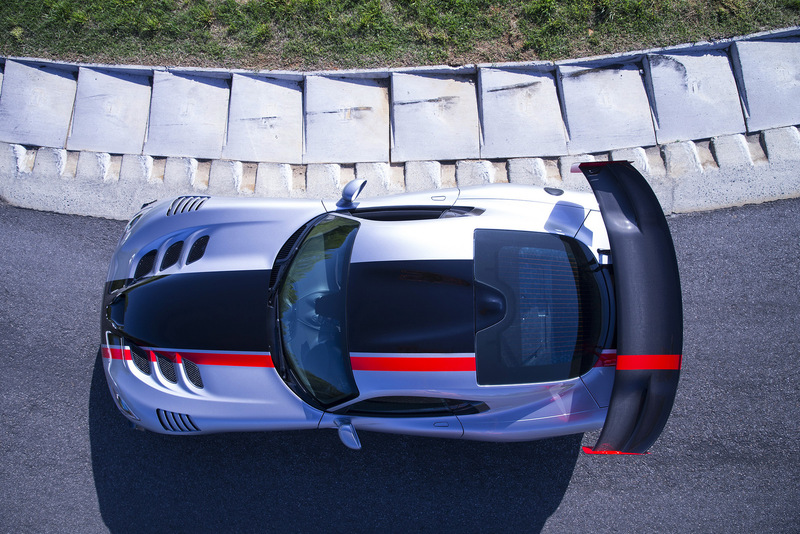 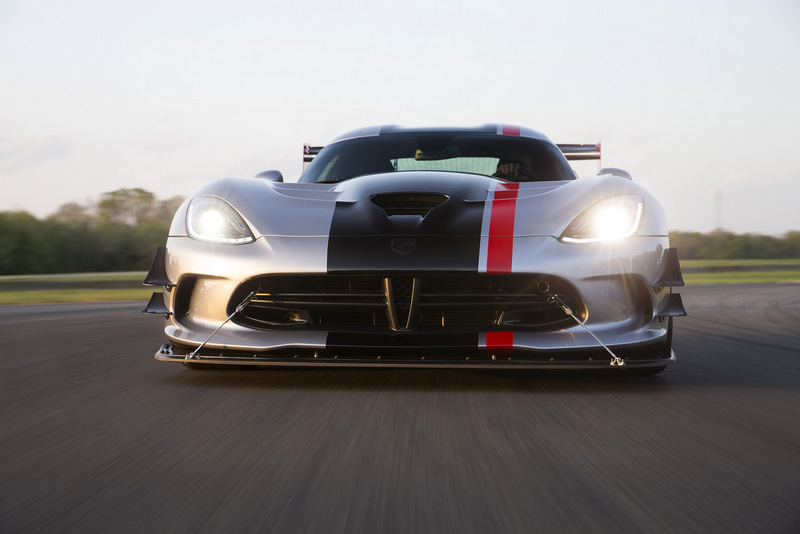 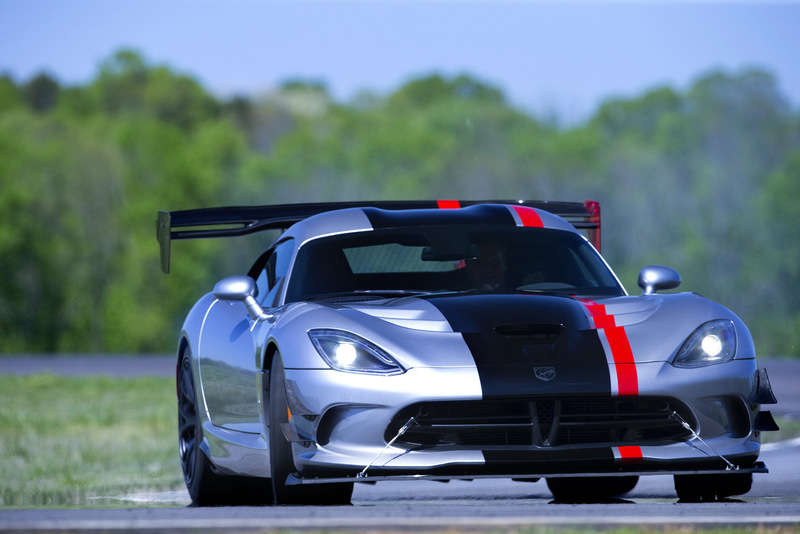 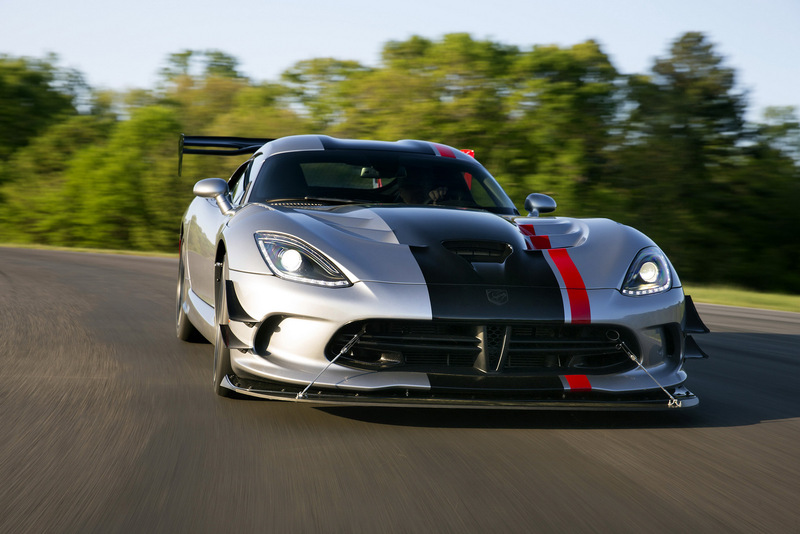 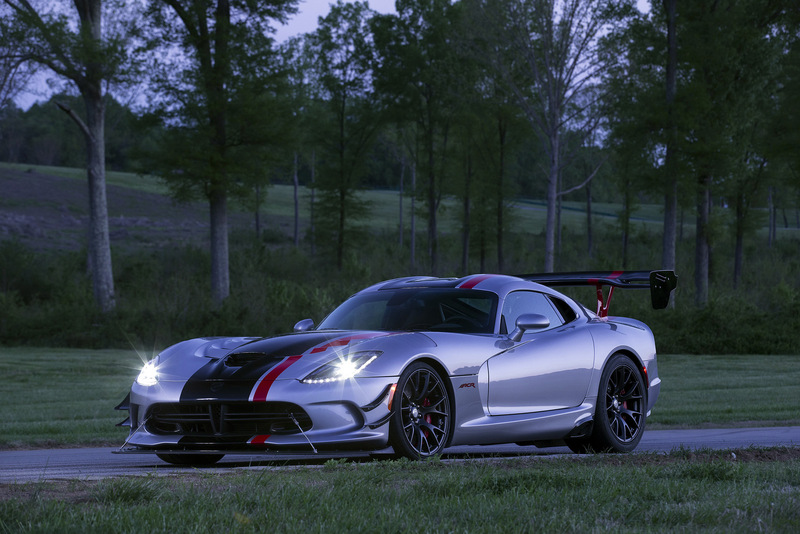 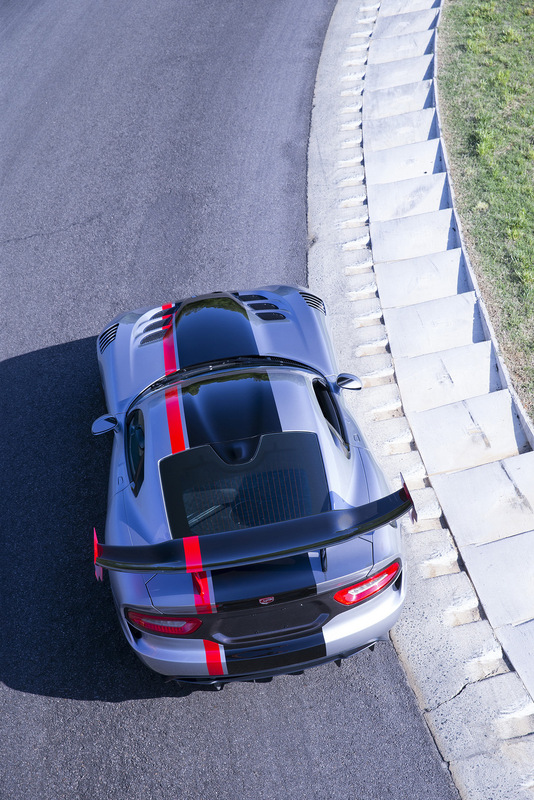 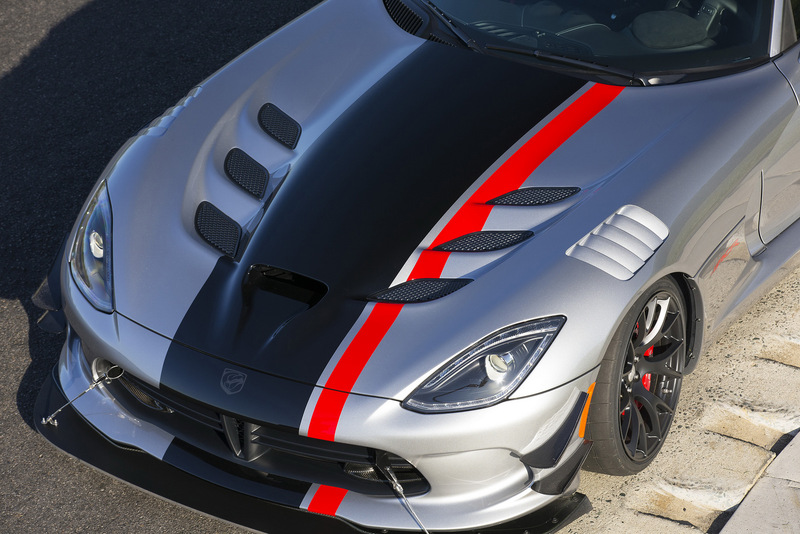 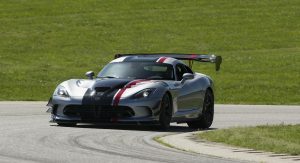 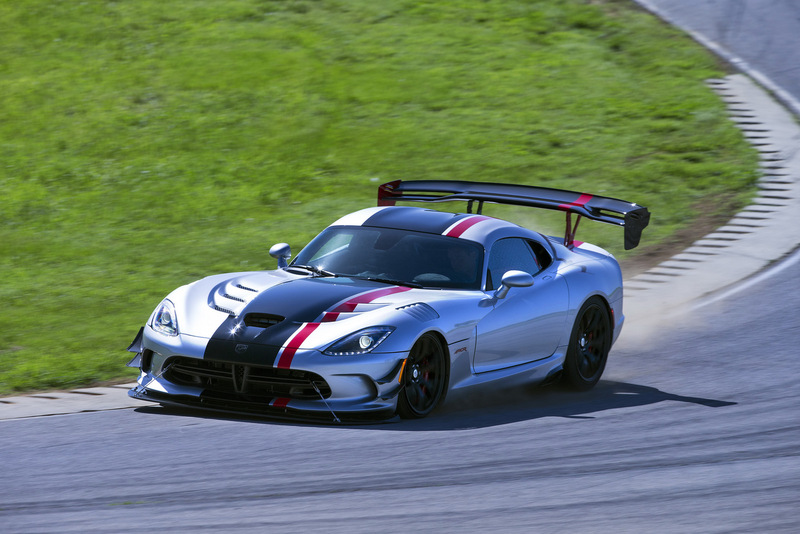 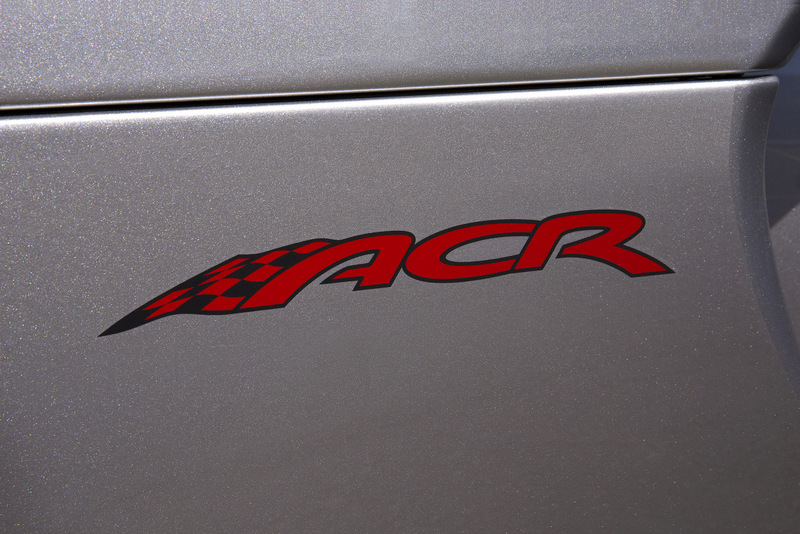 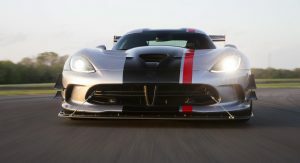 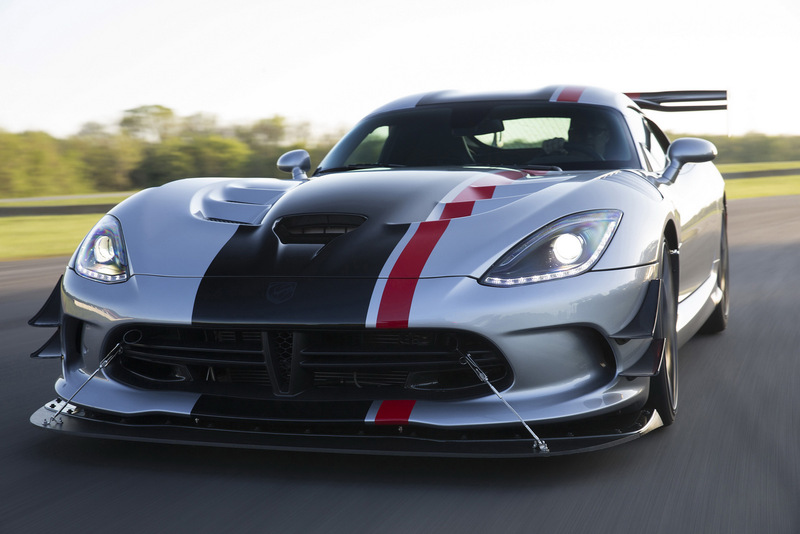 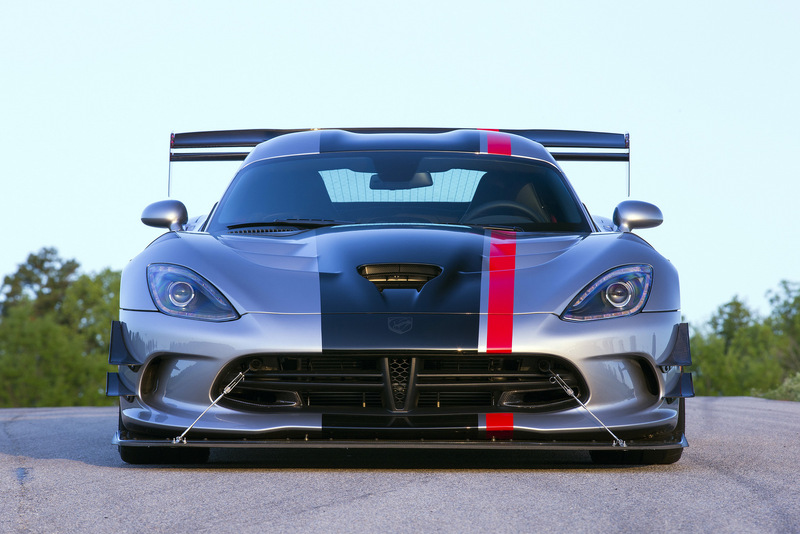 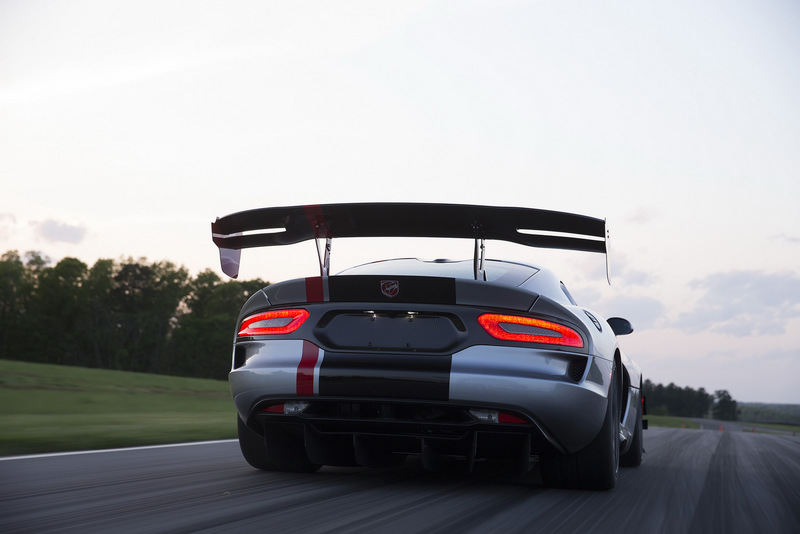 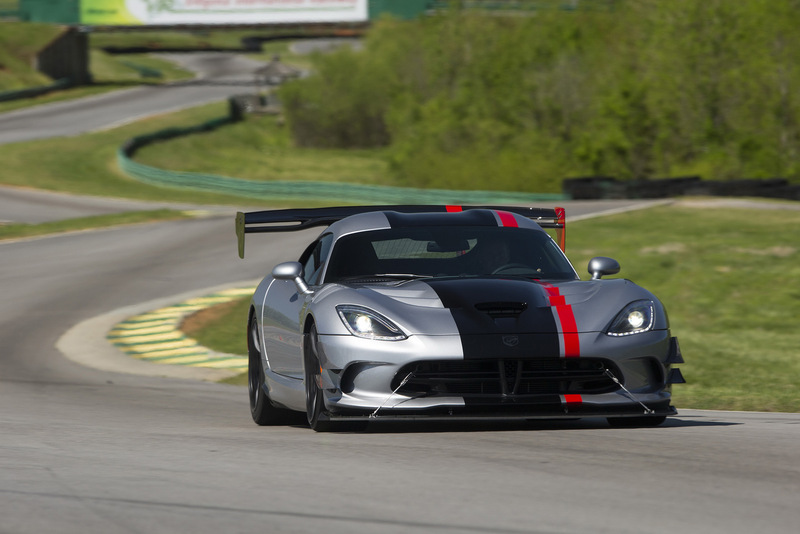 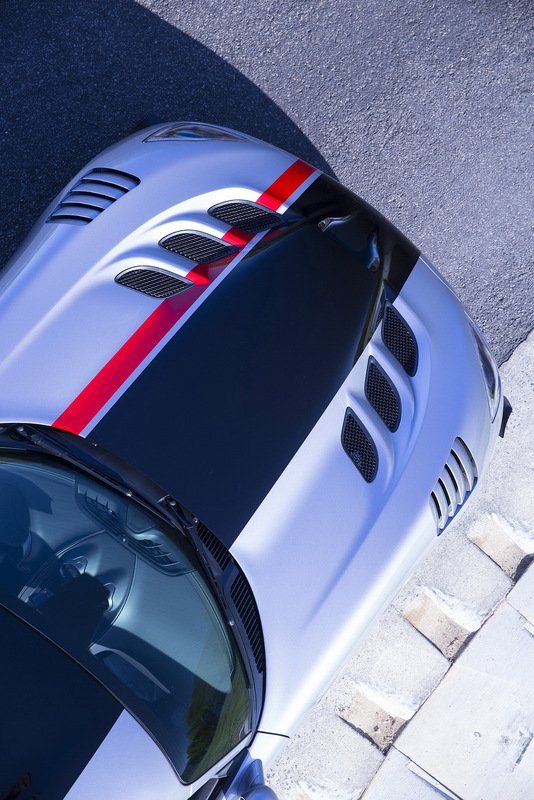 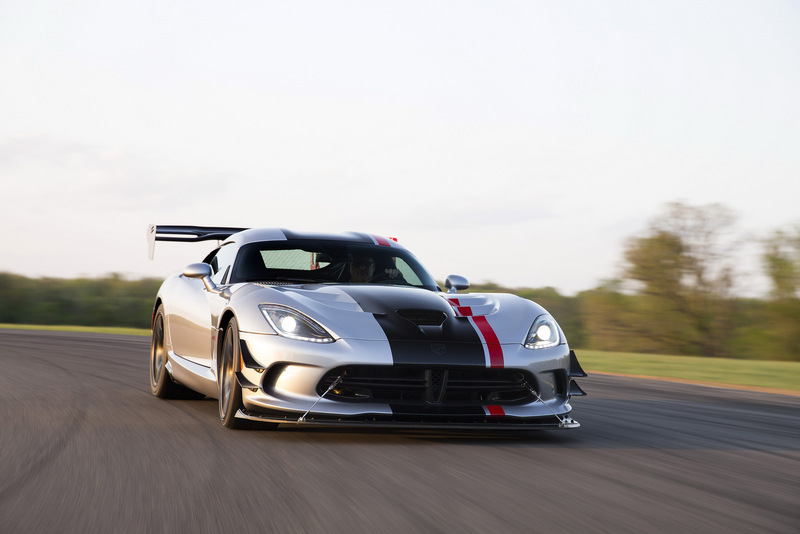 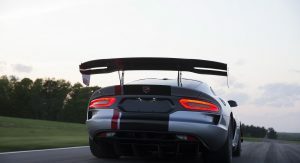 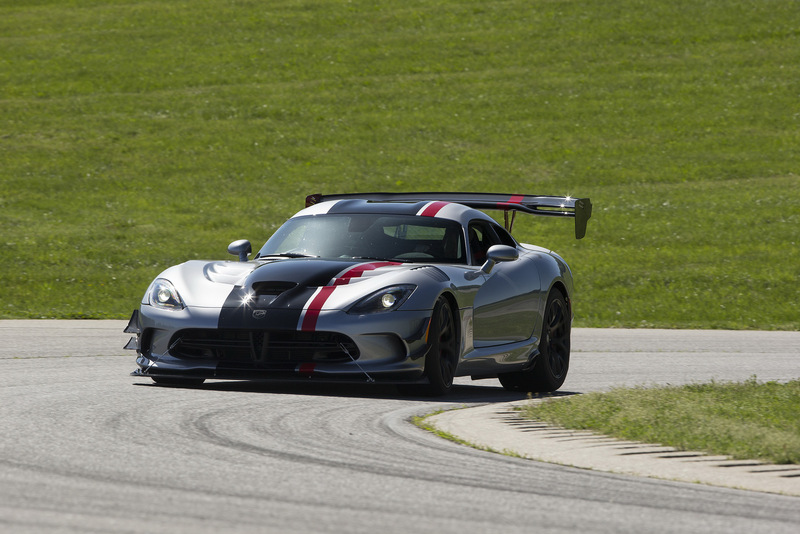 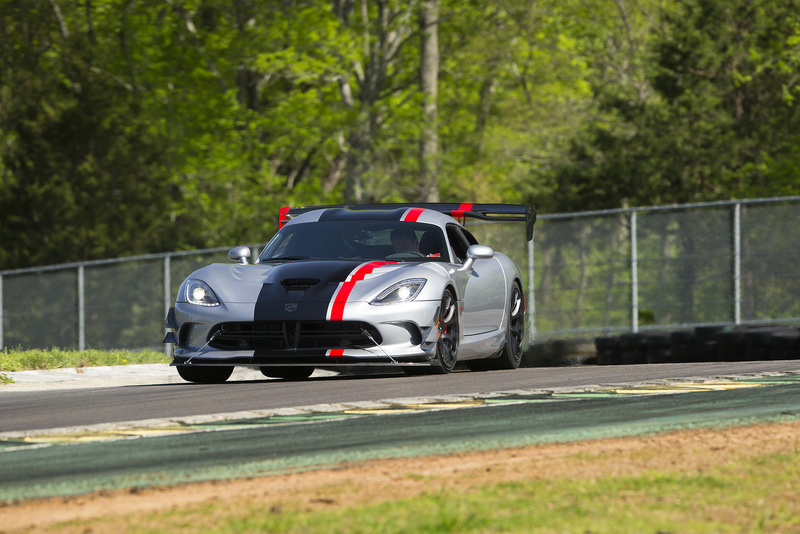 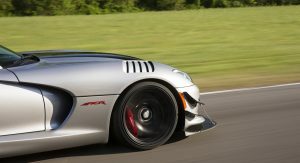 According to Dodge, the 2016 Viper ACR is capable of sustaining more than 1.5 g on high-speed turns. 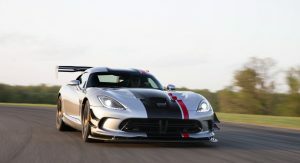 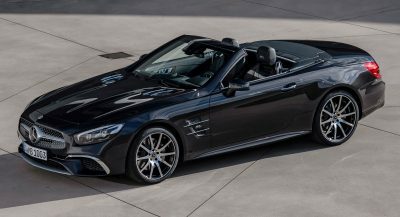 Under the long hood sits the same 8.4-liter V10, rated at 645hp and 600lb-ft (813Nm) of torque, mated to a Tremec TR6060 six-speed manual transmission. 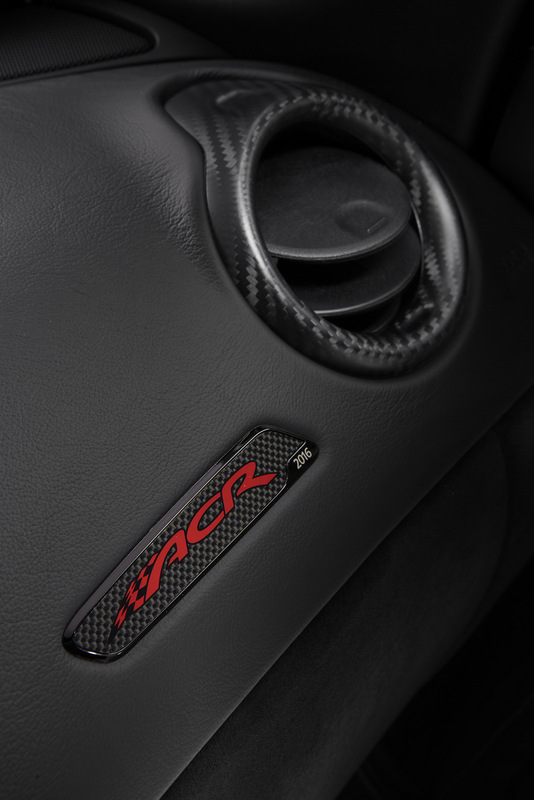 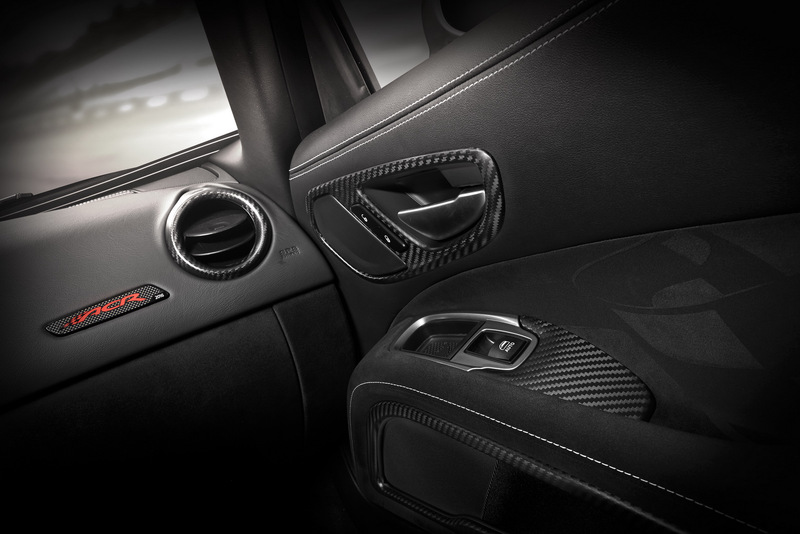 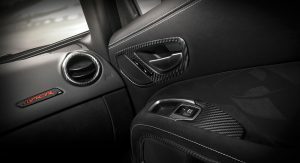 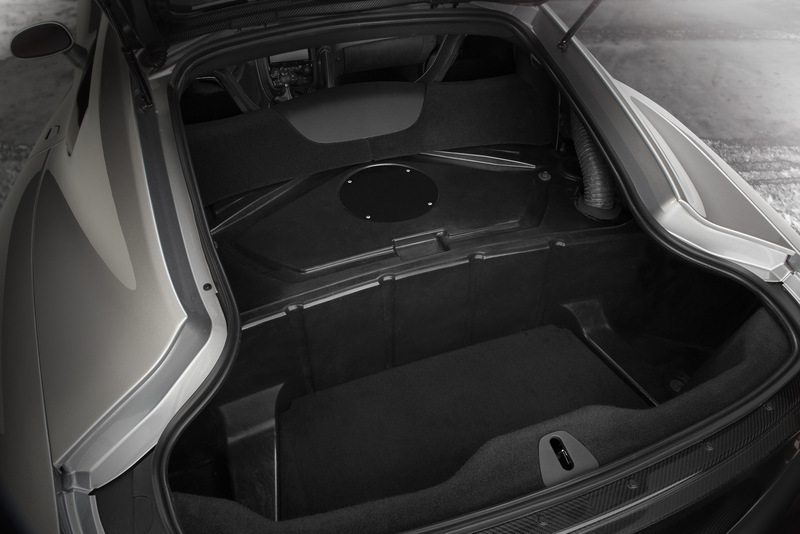 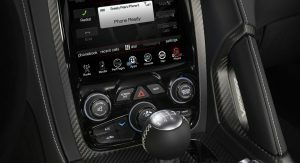 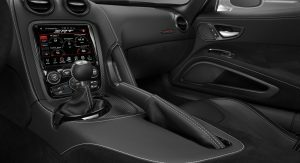 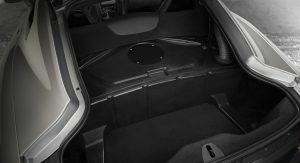 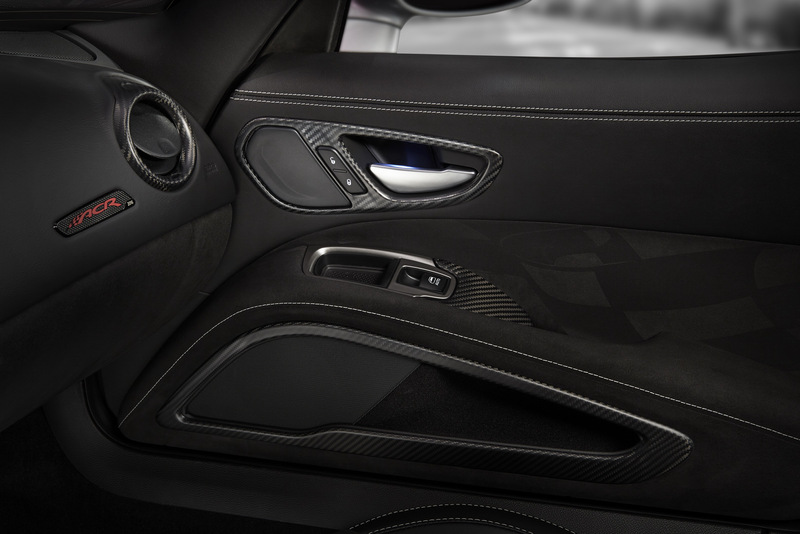 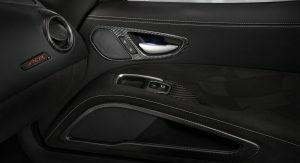 Interior appointments include Alcantara accents, including on the new high-grip seats, unique dash plaque finished in carbon fiber and the choice of silver or Header Red accent stitching. 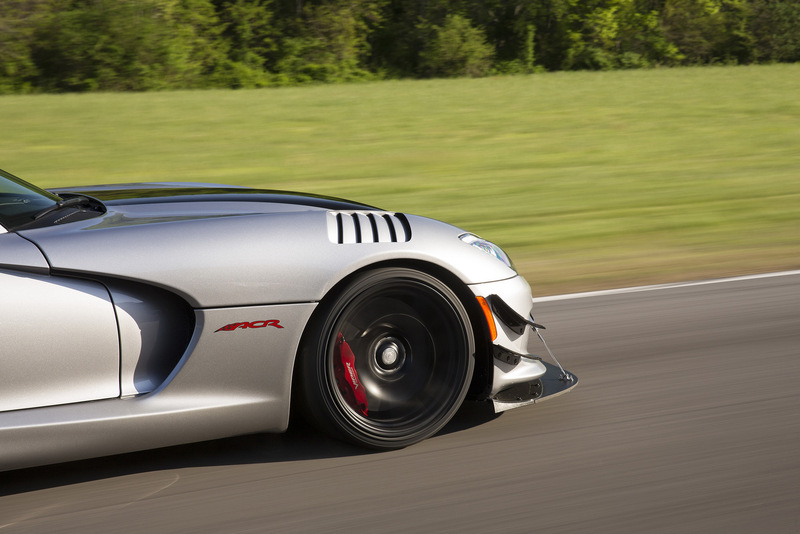 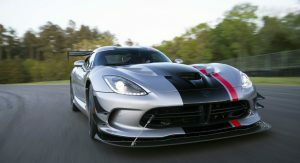 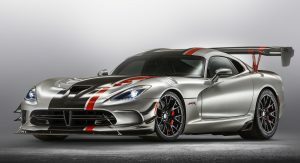 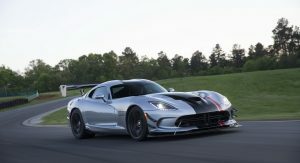 The 2016 Dodge Viper ACR goes on sale in third quarter 2015.